Print and fill out the choir camp 2005 sign-up form... Bring it with you on the first day of camp! In the summer prior to the 2002-2003 school year, the Merrillville High School Choirs held their first summer choir camp. The choir camp's goals were to improve both new and old students' skills in both singing and dancing. Summer instruction was provided by Mrs. Melinda Reinhart and Miss Robin Childress. The summer program was quite successful and enjoyed by the students. We would like to thank everyone for the time they dedicated over the summer to start this wonderful program, including the Choir Boosters, who provided refreshments for the students. We hope to be able to give students the opportunity to participate in this sort of a program in the future as well. 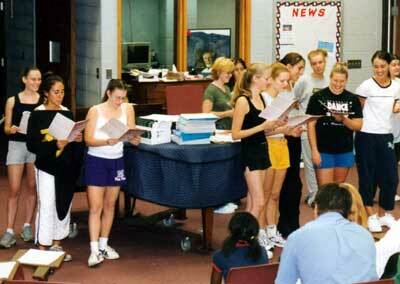 For more pictures from Summer Choir Camp 2002, see the photo album.